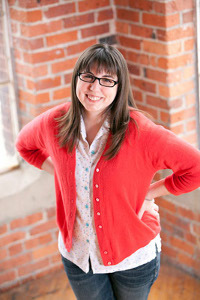 Meet Kristin Roach, today’s featured designer! Kristin started her own site CraftLeftovers.com back in 2006 as a way to keep herself crafting and using up her yarn stash. Now five years later, it’s a place for others to find patterns and to be inspired to create. Kristin crafts in many different genres and techniques, but crocheting has always been her favorite. She first crocheted with her mom when she was younger and now crocheting is even more special to her because of it. We have a few of Kristin’s awesome crochet patterns on AllFreeCrochet and these are my favorite! Be sure to check out Kristin’s designer profile to learn more about her and view all of her patterns! Lanels Mitts – Fingerless gloves are super popular right now so you should definitely try this pattern. These gloves are made with DK yarn and are super soft to wear. What’s nice about fingerless mittens is that you can still use your fingertips while keeping the rest of your fingers warm. Particularly Pink Crochet Dishcloth – This is a nice pattern if you have some scarp yarn and an itch to create something cute. Crocheted with a nice little loop in the corner to hang on a cabinet, this is bound to become your favorite dishcloth. How often do you crochet mittens or dishcloths? haven’t done mittens in umpty jillion years, but have made plenty of them. dishcloths? i make them in batches, every five years or so.